Abstract. Multi-filter images from the solar corona are used to obtain temperature maps that are analyzed using techniques based on proper orthogonal decomposition (POD) in order to extract dynamical and structural information at various scales. 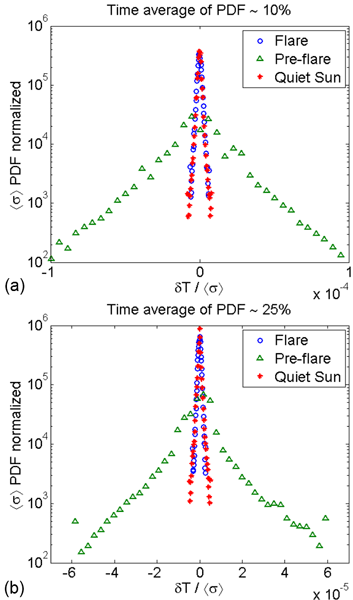 Exploring active regions before and after a solar flare and comparing them with quiet regions, we show that the multi-scale behavior presents distinct statistical properties for each case that can be used to characterize the level of activity in a region. Information about the nature of heat transport is also to be extracted from the analysis. 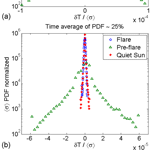 How to cite: Gamborino, D., del-Castillo-Negrete, D., and Martinell, J. J.: Multi-scale statistical analysis of coronal solar activity, Nonlin. Processes Geophys., 23, 175-188, https://doi.org/10.5194/npg-23-175-2016, 2016. We use temperature maps of the solar corona for three regions and use a technique that separates multiple timescales and space scales to show that the small-scale temperature fluctuations appear more frequently prior to the occurrence of a solar flare, in comparison with the same region after the flare and with a quiet region. We find that, during the flare, energy flows from large to small scales and heat transport associated with a heat front is convective along and diffusive across the front.